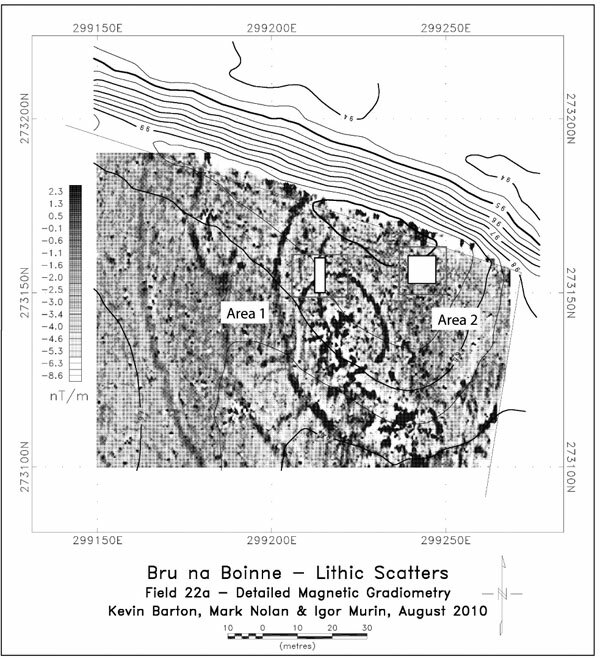 Based on the geophysics carried out in August 2010 immediately after last summer’s excavations, I put in an application to the Royal Irish Academy for further funding to return to the site and excavate in the core area on the top of the knoll. This appears to have been the focus of all the activity on the site. The lithic scatter is clearly centered on this feature and the later enclosures all encircle it. Standing on top of the knoll, it is not hard to see why it would have been an attractive spot for a settlement, whatever the period, dominating the land to the south and with a good view over the river while being out of the reach of the winter floods. Happily, the application to the RIA was successful and work will start again on the site on 4th July. Two areas of potential were identified. This was a difficult process firstly because of the huge overall size of the site. The time or the resources are not available to dig everything or even a large sample of the site so positioning cuttings is like playing ‘pin the tail on the donkey’. However, the geophysics are a big help. Choosing areas to focus was also difficult because it is almost impossible to identify features in the geophysics that are more likely to be early (ideally prehistoric and preferably neolithic). You normally get very little indication of the date of features from geophysical plots unless they are very recognisable. The chance that all such early features are long gone, destroyed by over zealous and unwitting early medieval remodelling, is constantly at the back of my mind. Figure 1: Areas 1 and 2 superimposed on the detailed magnetic gradiometry plot. This is located over the junction between the oval enclosure and the innermost D-shaped enclosure lying beneath it. See the last post for a discussion of these features. The innermost D-shaped enclosure feature appears to define the top of the knoll or topographic high and appears to be quite different in character to the other ditches. The character of the feature on the magnetometry plot shows it to be narrower and less magnetic than the other enclosures. 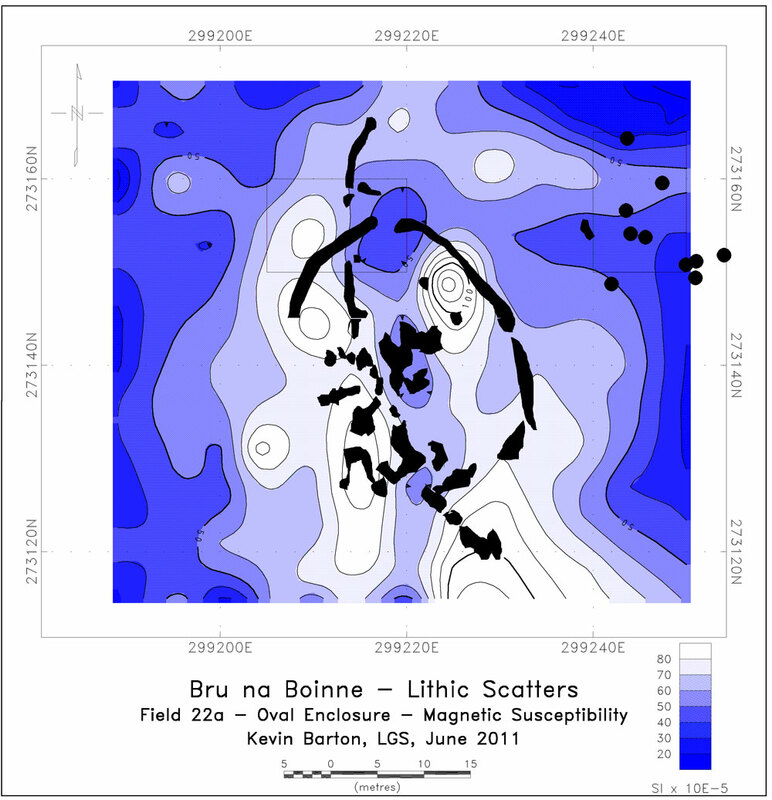 The magnetometry plot also shows that it is clearly cut by the oval enclosure suggesting a relative chronological relationship between the features. The earth resistance plot (Figure 2, last post) shows that the inner enclosure feature encloses an area of high resistance with a sharp delineation between the high-resistance inner area and the low resistance area immediately outside. The junction between the two areas appears to be particularly sharp and suggests a possible stone facing/revetment feature. This again suggests that the method used to construct the inner enclosure is different to that of the other enclosures. The area chosen lies well within the area defined by the lithic scatter. It is proposed to open a trench over the junction between the two ditches on the western side of the oval enclosure in order to examine the relationship between these features. Hopefully, it will be possible to retrieve material suitable for dating from the earlier enclosure. Given the apparent relationship between the oval enclosure and this inner enclosure, it is possible that the inner enclosure is early in date and possibly prehistoric. The second area of potential is also in the core area close to the highest point on the knoll. It shows up in the magnetic data as a circular cut feature of slightly positive magnetic gradient, c. 6m in diameter and possible with a centrally placed posthole and there are other possible pits or postholes immediately outside it. There is an area of lower resistance in the same location on the earth resistance plot (Figure 2, last post) and the magnetic susceptibility plot also indicates an almost discrete area of enhanced magnetic susceptibility to the north of the main area of enhancement (Figure 2, below). The feature lies at the north-eastern corner of the area defined by the lithic scatter. Given that this feature appears to be relatively well preserved and that it is potentially prehistoric in date based on its position and morphology, it is proposed to excavate a cutting over this feature to establish its date.